The brilliant Orange Sun Coral is a prized photographic subject for both hobbyists and professionals! The Orange Sun Coral Tubastraea faulkneri is so gorgeous, it often is found on the covers of coffee table books and books that specialize in corals. It has been the winning subject of photograph competitions, and it is easy to see why. With a bright yellow against a bright orange, it is so gaudy it is spell binding. Other common names these corals are know for are Orange Cup Coral, Sun Coral, Orange Polyp Coral, Rose Sun Coral, Golden Cup Coral, Sun Flower Coral, and Tube Coral. The corallites of the Orange Sun Coral, the hard round, tubular structures that the polyps live in. The corallites are covered with a tissue, called the coenosteum. 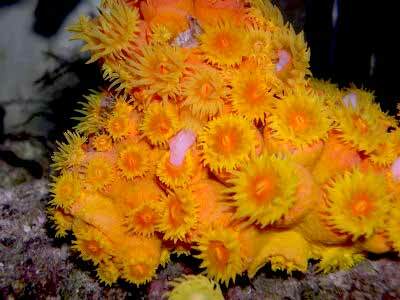 The fleshy tentacles of its polyps are bright yellow with the coenosteum having a bright orange color, and the very center of the polyps are also bright orange. They extend their polyps mostly during the evening hours, though they can be coaxed out during the day if food is present. During the day the coral is completely withdrawn and only the bright orange coenosteum is visible, making it look like a ball with raised round flat nubs. The Tubastraea genus can form colonies about the size of a fist in diameter. These will often grow on each other, forming a more complex and larger 'community'. Some branch into 40" (1 m) treelike structures. The Orange Sun Coral can form colonies around 6" (15 cm) in diameter. They are slow growers, only adding about 1.6" of growth per year. The T. faulkneri are also ahermatypic, which means they don't contribute to reef building. Lighting has no affect on the growth of the Orange Sun Coral. They are referred to as azooxanthellate, or non-photosynthetic corals. This means that, unlike most other large polyp stony (LPS) corals, they do not have a symbiotic relationship with the marine algae zooxanthellae. They survive in the wild with foods such as plankton they take from the water column. Some species also eat small fish. Like soft corals, the T. faulkneri can also produce bio-active compounds. Some of these can be damaging to the larvae of some corals, but one of these compounds, called tubastrine, has anti-viral properties. The Orange Sun Coral can be easy to moderate to care for, depending on the dedication of the aquarist. They can be very difficult for the aquarist who does not have the time for daily feedings, or adequate filtration. Yet they can be easy for aquarists with a strong skimmer and who are dedicated to following through with the care of this beautiful coral. The T. faulkneri have a voracious appetite and will multiply for you if you can keep up with their feeding requirements. Light will not harm the Orange Sun Coral, but they do not have a very good defense against algae. Algae grows fast in lit areas, and if algae is allowed to grow on the T. faulkneri, it will die eventually. Strong water movement is a must. Putting the coral in areas under ledges that usually do not have the water flow they need, can also cause algae growth. This is a great video that shows the variety that can be found in the Tubastrea genus. All, with the exception of the Black Sun Coral, can be kept in captivity if the aquarist is willing to do a few things. Feed daily with smaller foods like brine shrimp or cyclopeeze or every other day with larger mysis shrimp or finely minced marine flesh. Next would be water changes that need to be 2ce a week for smaller tanks like 20 gallon and once a week for larger 150 gallon or more tanks at a rate of 20 to 25% for each water change. Next, invest in a STRONG skimmer, ozone and use activated carbon. In such a tank, many soft corals and LPS and inverts for that matter can starve. On the other hand, since the water needs to be very very pristine, SPS, clams, scallops and oysters can make good companions! This video shows another way to feed your Orange Sun Coral. It is very clever and this way will make SURE your coral gets the food and those shrimp and fish do not. The tube should be just about as large as the coral so pieces do not get lost and out of the coral's reach. Orange Sun Coral, Tubastrea faulkneri, super close up! Okay, so I have 3 other videos, but this one is just incredible! It shows a wonderful close up of one polyp of the Orange Sun Coral! Make sure you feed that beautiful mouth daily or every other day with larger foods, keep the water very clean and invest in a strong skimmer and ozone! Distribution / Background Tubastraea Coral Information: The Tubastraea genus was described by Lesson in 1829. These corals are referred to as azooxanthellate or non-photosynthetic corals, which means they only survive with foods, and lighting has no affect on their growth. They are also mostly non-reef building corals, or ahermatypic. There are 7 Tubastraea species. They are the Yellow Sun Coral or Golden Cup Coral T. aurea, Orange Cup Coral T. coccinea, Brown Cup Coral T. diaphana, Orange Sun Coral T. faulkneri, Floreana coral T. floreana, Black Sun Coral or Green Sun Coral T. micranthus (previously known as Dendrophyllia migrescens), and T. tagusensis. Some common names the Tubastraea species are known for are Orange Cup Coral, Brown Cup Coral, Pink Cup Coral, Rose Coral, Orange Polyp Coral, Black Tube Coral, Sun Coral, Black Sun Coral, Golden Cup Coral, Sun Flower Coral, Tube Coral, Green Cup Coral, and Black Branching Sun Coral. The Orange Sun Coral Tubastraea faulkneri was described by Wells in 1982. They produce a bioactive compound with an anti-viral property called tubastrine. Some other common names these corals are know for are Rose Sun Coral, Orange Cup Coral, Orange Polyp Coral, Sun Coral, Golden Cup Coral, Sun Flower Coral, and Tube Coral. Tubastraea Coral Habitat: The T. faulkneri inhabit the entrance of caves and underneath overhangs in waters that have a high nutrient content and strong water flow. Additionally, they have actually been found in sunlight, as well as areas not related to the reef. They are found at depths from 0 to 131 feet (0 - 40 m). Status The T. faulkneri is not on the IUCN Red List of Endangered Species. Description What do Tubastraea Corals look like: The T. faulkneri form colonies around 6" (15 cm) in diameter, and sometimes will grow on each other, forming a more complex and larger "community." It is a non-reef building coral, or ahermatypic. Their Corallites, or the hard round, tubular structure the polyp lives in. The corallites are covered with a tissue, called the coenosteum. The polyps of the Orange Sun Coral are very fleshy, and extend mostly during evening hours, though they can be coaxed out during the day if food is present.The coral has tentacles that are a bright yellow, with the coenosteum having a bright orange color, and the very center of the polyps are also bright orange. During the day the coral is completely withdrawn with only the bright orange coenosteum being visible, making it look like a ball with raised round flat nubs. T. faulkneri is the most recognized of the Tubastraea genus. It is said these corals only grow 1.6" a year (4 cm). Life span is unknown. Difficulty of Care Tubastraea Coral Care: The Tubastraea genus can be easy to moderate to care for depending on the dedication of the aquarist to feed the coral every day. Light will not harm them, but they do not have a very good defense against algae, which grows fast in lit areas. If algae is allowed to grow on the Orange Sun Coral, it will die eventually. Putting the coral in areas under ledges that usually do not have the water flow they need can also cause algae growth. Strong water movement is a must. Foods / Feeding Tubastraea Coral Feeding: The Tubastraea genus are referred to as azooxanthellate, or non-photosynthetic corals. This means that, unlike most other large polyp stony (LPS) corals, they do not have a symbiotic relationship with the marine algae zooxanthellae. To feed they capture planktonic organisms, food particles from the water column, and can absorb dissolved organic matter. Some also eat small fish. In captivity, the Orange Sun Coral needs to be fed decent sized foods like enriched live or defrosted, or freeze dried adult brine shrimp, mysis shrimp, and other similar sized prey. Soak the food in a vitamin supplement, since that seems to help the coral reproduce faster. If they are well fed, they get a "bloated" look. Feed daily. New colonies may need the juice of the shrimp wafting across the tops of their closed polyps for a few nights before they start to feed. Be patient and persistent since this can take up to 2 weeks. Feeding the same time each evening will get the best response. These corals will stop extending their tentacles and gradually waste away if they are not fed. There are several ways to approach feeding your Tubastraea, so they can hold onto the food. One way is to take the coral out of the tank into a container with warm tank water (or float the container in the tank to keep it warm) and feed the polyps a high concentration of food. After the coral has fed, it can be put back into the tank, and the fouled container of water discarded. This option will help keep the water quality high. Remember to wiggle the coral so the polyps pull in before removing. The second way is to leave the coral in the tank. Put on a feeding "cap" to keep the food from blowing away, and also to keep shrimp and fish from taking the food out of the polyp's mouth. The third choice is to simply turn off the pumps. But remember to turn them back on after they have fed. Magnesium: 1200 - 1350 minimum. Magnesium makes calcium available, so if your calcium is low, check your magnesium levels before adding any more calcium. Aquarium Parameters A well-feed live rock/reef environment is what is needed for your Orange Sun Coral, along with some fish for organic matter production. A strong skimmer is recommended to take care of the nutrient load added by the heavy feedings needed for these corals. A mature tank is recommended. Be sure to have a strong water movement. Tubastraea species are tolerant of lighting in the aquarium. This is a peaceful species, but other corals may not be, so provide adequate space between species. Compatibility and Social Behaviors The T. faulkneri is peaceful towards other corals. However they do not have strong stinging tentacles, so need to be kept away from other corals. The only impact they will have on other corals is connected to their need to be fed large amounts of food, that may foul the water. The Tubastraea genus is preyed upon by the Tubastrea Snail Epitonium billeeanum. These snails have a very similar color and shape as the coral's polyps when closed. The nudibranch Phestilla melanobrachia is another pest. It comes in the color of the specific Tubastraea that it feeds on. Check your specimen closely when you get it, to find and remove these pests. Breeding and Reproduction The large polyp stony (LPS) corals are hermaphrodites, male and female within the same organism, and can reproduce both sexually and asexually. In the wild they reproduce sexually by releasing eggs and sperm at the same time, resulting in a fertilized egg which then forms into a free-swimming planula larva. Eventually the planula larvae settles onto the substrate, becoming plankters. This then forms a tiny polyp which begins to excrete calcium carbonate and develops into a coral. Planula larvae are extremely vulnerable to predation, and very few survive. The Tubastraea genus can reproduce asexually as well through budding. In captivity, propagating the T. faulkneri is done quite simply by breaking off pieces from a healthy colony. Another way is to keep the coral well fed with good water flow, and let it propagate by itself. Potential Problems Light will not harm the Tubastraea species, but they do not have a very good defense against algae. Algae grows fast in lit areas, and if algae is allowed to grow on the T. faulkneri, it will die eventually. Strong water movement is a must. Putting the coral in areas under ledges that usually do not have the water flow they need, can also cause algae growth. The Tubastraea species have voracious appetites and must be fed regularly. These corals will stop extending their tentacles and gradually waste away if they are not fed. Availability Tubastraea Corals for Sale: The T. faulkneri is easy to find at pet shops and on line. Online they can run about $33.00 - $55.00 USD or more depending on size and/or color.